Ghostbed Reviews: Is This Mattress The Right One For You? Did you know that you should replace your mattress every ten years? Selecting a new bed can be a daunting task, whether you abide by that or have just decided that it’s time for something new. There are too many products on the market to choose from, and each one claims to be the best night’s sleep of your life. For the price, more than half of them better live up to those expectations. While shopping around, you might have come across “bed in a box” style mattress sold online at a lower price than their traditional counterparts. Saving money is great, but how can you tell if a few dollars saved means cutting quality? It isn’t easy, which why reviews like this one can help you make a smart buying decision. We’ve taken Ghostbed, a popular online option, and dissected every aspect of this bed from its construction to what users have to say about it. Here’s what we found. What Is a Ghostbed and How Does it Work? How Does The Ghostbed Compare to Similar Mattresses? It’s an unusual name, but Ghostbed has nothing to do with the afterlife. This company is an online retailer that sells foam mattresses at value prices. They offer two variants of their “bed in a box” products: the original Ghostbed and the Luxe version. The original is considered firmer than the average mattress and is crafted from high-quality components. Their business model is similar to Leesa or Saatva, which you might have seen while watching TV. For these Ghostbed reviews, we’re going to focus on the original mattress design. You can order the Ghostbed in any size from twin to king, as well California King. Its top layer is meant to promote airflow, aiding in keeping you cool throughout the night. With gel memory foam as the second layer, the cooling effect doubles and helps to eliminate heat retention. Using gel instead of standard memory foam allows the mattress to maintain its shape longer, offering a stronger level of resistance against the weight of your body as you lay down. This makes for a firmer experience that can provide excellent pressure relief. 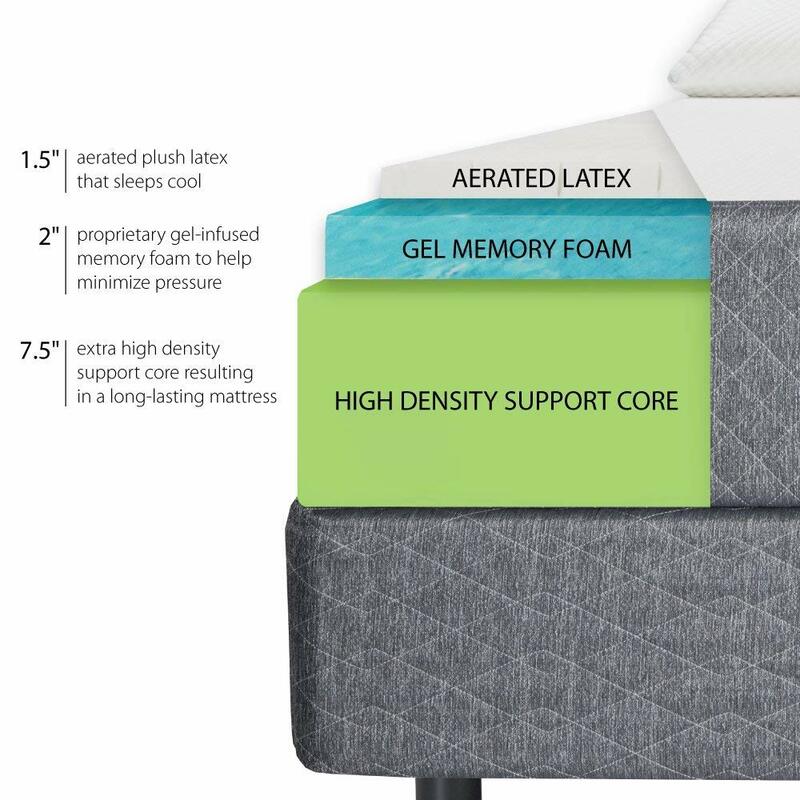 The latex layer provides the bounce associated with most mattresses while balancing out the firmness of the gel memory foam. You don’t have to worry about sinking down into this bed, and the combination provides ample durability to prevent against recessing over the years. Firm mattresses are often recommended for anyone that sleeps on their back or side, helping to align and support the spine to prevent aches or pains. All of that being said, is there any reason to choose this mattress over another? 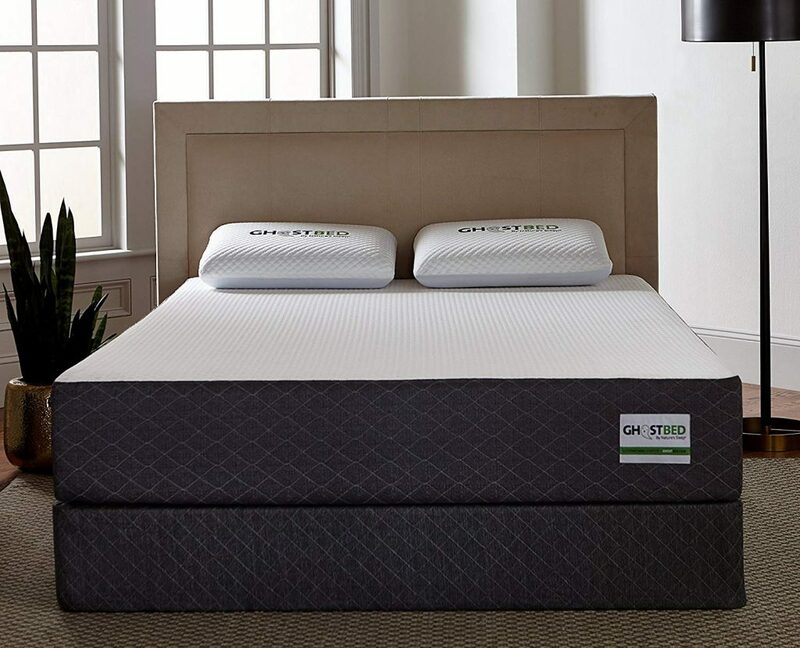 The Ghostbed is similar to many other online “out of the box” mattresses. 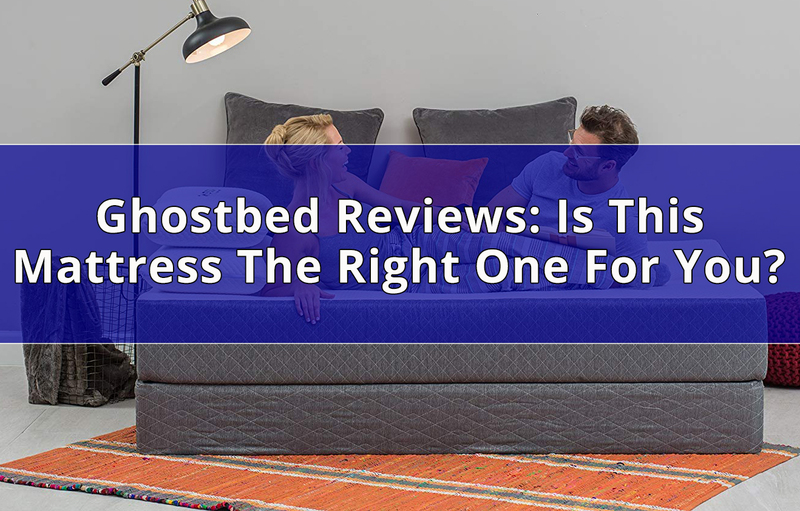 A quick search for Ghostbed reviews will turn up plenty of articles comparing them. However, there are a few factors that help this bed to stand out. For starters, these types of mattresses can be incredibly expensive when compared to higher-quality, store-bought varieties from major names in the industry. Ghostbed stays in the value range despite using high-quality materials, avoiding overpricing their product like many companies choose to do. We cover prices below. The mattress shoots for the middle range of balance and firmness. While it is a little firmer than most, it remains a balanced mattress for back, stomach, and side sleepers. The increased stability is excellent for reducing aches and pains as well as spinal health. Unlike its competitors, this mattress still has a decent bounce. Many online box beds are stiff in this department, which may or may not be something you’re looking for. This can be a pro or con for some, making it worth noting. Pricing for the Ghostbed depends on the size bed you decide on. Each also comes with a different weight. The twin costs $495, weighing 58 pounds and offering dimensions of 38” x 75” x 11”. There is a Twin XL size with a $650 price tag. It weighs 62 pounds and increases the middle dimension to 80”. The Full size jumps to $845, weighs ten more pounds than a Twin XL, and is 54” x 75” x 11”. After looking at numerous Ghostbed reviews, this product receives the online version of a standing ovation from almost everyone who has used it. From its construction to how it feels to sleep in, the vast majority of individuals seem incredibly satisfied with their purchase. Reviewing sited did not that some people will enjoy while other won’t. They seemed to agree upon why for both demographics, as well. Sites agreed that combination sleepers will enjoy the level of firmness and support provided by the mattress as well as the subtle, soft bounce from the top layer that adds extra cushioning. Sleepers who feel overheated at night should enjoy the cooling effect this mattress provides. Both the latex and top cover offer temperature regulation, positioned in a way that moves heat outwards from the mattress instead of collecting it near the body. They also agreed that this mattress is excellent for anyone with higher weight considerations. With its thick build and high-density base, its made to handle up to 750 pounds. That’s significantly higher than other competitors in the online “bed in a box” industry. Sites noted that anyone looking for the traditional memory foam comforts in these types of mattresses would be disappointed. The inclusion of gel memory foam offers increased pressure relief, but it isn’t as soft and inviting as traditional makes. Some sites said that you might not like this mattress if you are a side sleeper. They reasoned that the firmer texture props the shoulders up too high, causing slight discomfort over time. With your shoulders elevated instead of sinking into the mattress, you might end up with increased back pain over time. Most people recognize these “out of the box” style beds from commercials on TV, namely the Leesa. Leesa happens to be this company’s primary competitor, so comparing the two can help you decide on whether this mattress is the right fit for you. Looking at both, there are some notable differences. The Ghostbed is thicker than Leesa by over an inch, but the comfort layer in Leesa is thicker by half an inch. That means the Leesa is a softer mattress altogether, confirming the level of firmness reviewers mention when talking about the Ghostbed. On the firmness scale, Ghostbed comes in around 6.5-7 out of ten, making between a firm and medium firm. One of the main problems that other online mattress retailers have is creating “hard as a rock” beds. This bed also offers ample edge support, which is a category boxed mattresses usually perform poorly in. You’ll be able to sleep on the side of this bed without feeling as though you may roll out. It will still compress when you sit on the edge, but it can hold you in place if you enjoy dangling your arm off the side. Finally, the Ghostbed is cheaper than the Leesa by far. In fact, this mattress is less expensive than most of its competitors, even when heading up into larger sizes. There are a few other features we would like to mention before giving our final verdict on this product. First, it comes with a 20-year warranty, which is excellent. Most experts recommend changing your mattress about every ten years, so you could potentially replace this one twice before your warranty ends if you feel that you need to. Second, the Ghostbed comes with a trial period of 101 nights. Despite the much-appreciated reference to literary classic 1001 Arabian Nights, we like that you can just return it if you decide that this isn’t’ the mattress for you. Over one-hundred nights is more than enough time to get a good feel for what the bed is like to sleep on, too. If you’re buying this bed directly from the company, they offer free shipping to the United States. There additional charges for freight shipping to Alaska and Hawaii, but all inland states receive no additional cost for delivery. The Ghostbed is also CetriPUR-US certified. CetriPUR is a third-party organization that tests foam products for hazardous chemicals and metals. Being certified, you don’t have to worry about things like phthalates, ozone depleters, formaldehyde, or lead. Ghostbed comes from the owners of Nature’s Sleep, who have numerous environmental initiatives. The company works to reduce packaging waste, freight space, and their dependence on fossil fuels. If minimizing your carbon footprint is essential to you, then this bed offers that option. Finally, the base can be adjusted with different foams offered through the company. This allows you to change it out for a softer one if you wish, though many seem to enjoy the mattress the way it is. All in all, we think this is an excellent mattress. We’re all for saving a buck where we can as long as no corners are cut on quality. 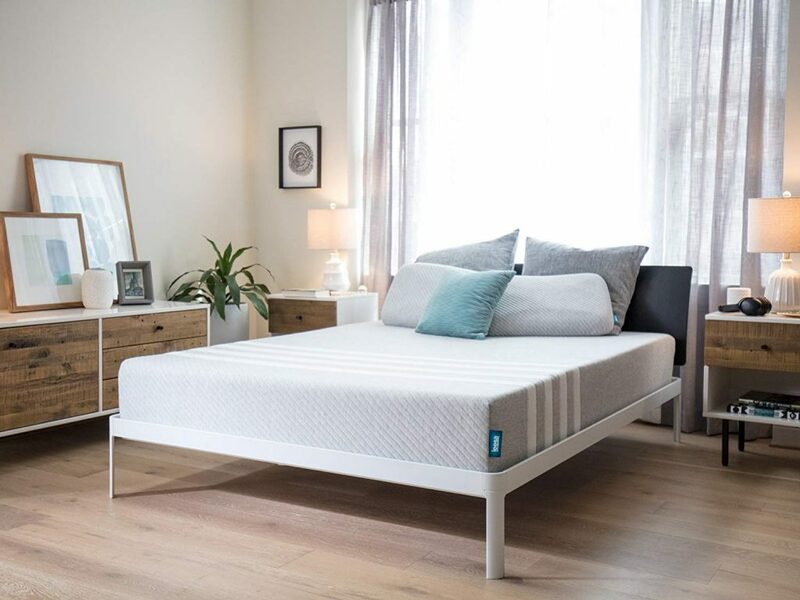 Ghostbed gains out favor by delivering the same level of quality you can expect from significant brand memory foam mattresses and online “bed in a box” retailers like Leesa while keeping their prices in the value range. The construction is incredibly durable, and the machine washable cover is a nice touch over many of its competitors. Ghostbed’s ability to provide edge support when others can’t is impressive, and their products ability to offer the correct support for your spine shows that time when into its design. As for comfort, no one seems to complain about how sleeping on this mattress feels. We understand that not everyone is going to like a firmer bed, so keep that in mind before you make a purchase. However, giving the bed a try for 101 days to see if you like it is an excellent deal in our opinion. We also like that you can order a California King sized Ghostbed as well as the Twin XL. Not every company offers every bed size possible, but this one thought about pleasing a broader customer base and covered that in its sizing. Finally, we like the 20-year warranty. Even after the 101 night trial period, you can always replace your Ghostbed if something should happen to it. If you do replace your mattress every ten years, then this warranty time frame is an excellent way to do that long before time is up. We give the original Ghostbed a five out of five rating. This is a solid product from a respectable company, and it’s a fantastic deal. Our research pulled up little in the way of discounts for the Ghostbed, which makes its lower price tag a little more appealing. However, we did find a few useful coupon codes that claim to offer 50% off or $170 off. There were no current incentives from the company themselves, though. Keep in mind that a large number of coupon sites are fronts for scams. Never disclose any information outside of your email address, and never trust a website that wants you to pay for coupons. We recommend using HoneyFund, a free search bar tool that hunts for valid discounts and deals for you. For starters, these types of mattresses can be incredibly expensive when compared to higher-quality, store bought varieties from major names in the industry. Ghostbed stays in the value range despite using high-quality materials, avoiding an overpricing their product like many choose to do. We cover prices below. The mattress shoots for the middle range of balance and firmness. While it is a little firmer than most, it remains a balanced mattress for back, stomach, and side sleepers. The increased firmness is great for reducing aches and pains as well as spinal health.